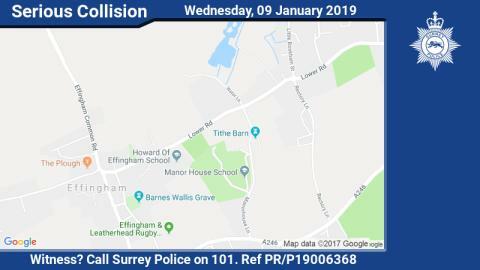 A female moped rider in her 50s was sadly pronounced dead at the scene shortly after the collision which occurred in Lower Road around 9.30am. The collision also involved a blue BMW estate and a blue Volkswagen Beetle. No one else was injured as a result of the collision. One of the drivers, a 31-year-old woman from Epsom, has been arrested on suspicion of causing death by dangerous driving and is currently in custody. Anyone who witnessed the collision, particularly anyone with any dashcam footage, is asked to contact us on 101, quoting incident reference PR/P19006368.